Exposure to asbestos increases your risk of developing lung disease. In general, the greater the exposure to asbestos, the greater the chance of developing harmful health effects. Disease symptoms may take many years to develop following exposure. Home buyers and sellers may not be aware of vermiculite insulation inside a home. It be may hidden under floorboards, inside walls, or under fiberglas insulation in attics. One indication of vermiculite may be the appearance of pebble sized silver-gold material on the floors of the home - it can "leak" out of the walls and ceilings through small gaps like electrical outlets and overhead lights. Any disturbance of this insulation could potentially release asbestos fibers into the air. If you absolutely have to go in your attic and it contains vermiculite insulation, you should limit the number of trips you make and shorten the length of those trips in order to help limit your potential exposure. A majority of the contaminated vermiculite distributed in this country was sold under the name "Zonolite". 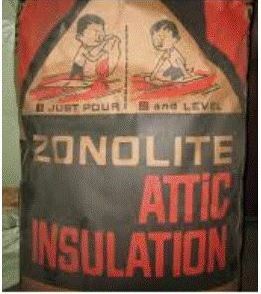 The Zonolite Attic Insulation Trust was created for the benefit of homeowners with the ZONOLITE brand of vermiculite attic insulation. Specifically, Trust funds are used to reimburse homeowners a portion of their cost to remove or contain Zonolite attic insulation. You can go to the ZAI Trust website for more information. ​How can I tell if I have vermiculite insulation that contains asbestos? Because it is estimated that 70% of all vermiculite insulation produced in the US was from the Libby mine, you should assume that any vermiculite insulation you encounter contains asbestos and take precautions. Testing of vermiculite insulation for the presence of asbestos fibers can be performed by specialty laboratories, however testing can be very expensive and may give false results depending on the methods used. We also do not recommend opening walls, ceilings, or floors to look for vermiculite insulation. If vermiculite is present in any of these spaces, it is best left undisturbed.